NSHC is looking for a volunteer interested in coordinating property improvement projects on the 14-acre North Star House grounds. Qualifications- Experience with general construction methods involving basic carpentry, concrete work, irrigation systems, building maintenance, driveway maintenance and general site improvements. A background in landscape or building contracting is important. Experience: Able to visualize projects and solutions, assist with construction budgeting, organize work schedules, order materials, coordinate and encourage volunteers. Please use this contact form or call 530-477-7126 to leave a message for David Wright. New Irrigation System Installed. The old system was failing and unable to keep up with irrigation needs for the 14 acre grounds and landscaping. The Growers Market takes place every Saturday from 8 am 12:30 pm through November 17. The North Star House is is open to the public from 9 a.m. until noon — until October 13. Tours will resume in May 2019. If you wish to plan a visit to The North Star House, there are docents on hand Mondays from noon – 3p.m. throughout they year, excluding holidays. Perhaps you will be inspired to lend a hand. There are many outdoor and indoor projects in various stages of completion. Stop by and say hello! The vision of transforming the North Star House into a cultural event center and museum open to the community is now a reality. The North Star Historic Conservancy is pleased to announce that the North Star House is now open to the public every Monday from 12 – 3 pm. During these “open house” hours, history docents will be on hand to either give informal tours or answer questions about the North Star House, its nationally known architect, Julia Morgan, and its first inhabitants, Arthur DeWint and Mary Hallock Foote. Come view this iconic landmark with your friends, family or business associates. Children and students are welcome! Learn about famed architect Julia Morgan and its construction in 1905 for the owners of the North Star Mine. The North Star House served as the social headquarters of the North Star Mine, and was where the public and investors were invited to meet and greet. This special example of California Craftsman Style architecture is on the National and the California State Historic Buildings Registers. Through the efforts and vision of countless volunteers and leaders of our community, this 10,000 square foot building stands today, very much intact. You can also view the current restoration efforts and the next steps in renovating the 2nd floor into an art gallery and museum. The North Star House is managed and operated by the North Star Historic Conservancy, a 501(c)(3) nonprofit organization. The North Star House and historic grounds are available to rent for weddings, events, meetings or parties. The open house would be an ideal time to tour the site and see how the House might work well for you to create a little history of your own, by holding an unforgettable event at the North Star. Questions can be directed to our office at 530-477-7126 or emailing thenorthstarhouse@gmail.com. In honor of Veterans’ Day, the North Star Historic Conservancy presents author Gage McKinney to tell the story of William Hague, the young manager of the North Star gold mine, who took American know-how to Europe and died in a field hospital in France. When war began in August 1914, William Hague represented interventionist sentiment at a time when many Americans wanted to stay clear of European conflicts. He was the product of an international mining culture which urged America to join the fight and exercise global influence. After the U. S. entered the war in 1916, and men like Hague shipped to France, American engineers changed the course of the brutal conflict. You will learn how mining men served, and why the exploits of one North Star miner were so … that they were recounted in a Hollywood movie. McKinney’s books include The 1930s: No Depression Here and MacBoyle’s Gold. He descends from Cornish miners and lives in Grass Valley. 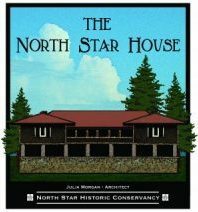 Built by Julia Morgan in the Arts and Crafts style in 1905, the North Star House is listed on the National and State Registers of Historic Places, and is located on a 14-acre portion of the former North Star Mine. The North Star Historic Conservancy, a nonprofit 501(c3), is working to re-establish this unique, historic house and grounds into a premier cultural event center. It is committed to maintaining the property for the public by promoting tours, events, educational activities, and the arts. 2-3 PM Presentation, followed by Q & A, refreshments, and book signing. Cost: Free admission. Donations appreciated. The North Star Historic Conservancy presents the Annual House Party at the North Star House — a Boomer Bash, on Saturday, July 28, from 5:30 -9:30. The One Mile band will provide music from the 50’s, 60’s and 70’s. There will be ‘Rock’n, Bop’n, Stroll’n and Roll’n and a whole lot of Shake’n going on. There will be room for dancing in the courtyard. Select something vintage from your wardrobe, as there will be prizes for the best dressed representing each decade. The Roamin’ Angels will have vintage cars on display to set the mood. A barbeque dinner is included in the ticket price. There will be a Raffle table and and a No host bar. There is always a large and ever-increasing variety of produce, meat products, fish, flowers, crafts, and food vendors. And live music! Grab a cup of coffee and a morning snack and enjoy the view from the stone terrace of The North Star House. And take a peek inside at the recent rehabilitation work. Improvements are constantly being made. The North Star House is open to the public from 9am to noon during the Growers Market. Docents are on hand for House tours and to answer questions. Perhaps you will be inspired to lend a hand. There are many outdoor and indoor projects lined up for this year. Please stop by and say hello! Seeking information for your Wedding? Fill out this form and we will get back to you ASAP.